The idea of elderhood may sound good, but where do we find the role models, the route to this destination? These days, we need to create our own map. The place of elders in tribal society offers some useful ideas: but our own times are so different that we can’t start from here. People just aren’t waiting around to receive the wisdom of the elders any more. If we think about the maiden-mother-crone model of three ages of womanhood, it shows us a big part of the problem, for men and women: getting old is not seen as desirable or fruitful. The media assail us with the cult of youth. So how do we start the map-making? One relevant feature of tribal elders is the way peer groups would evolve a wise response to new challenges. I have helped create such gatherings for maturing men and women, and they can start the process of finding yourself as an elder. Discovering your identity through a group, not individually, may be novel in our society, but it’s relevant in elderhood. Carl Jung said that in early adulthood, we choose to fulfil a few parts of ourselves, and if in midlife we don’t open the door to the other parts, they’ll break in through the window. So there’s an inner collective involved in elderhood as well as an outer: your inner voices not only need to be heard, but also gathered and guided in a positive direction. I believe adolescence is a useful model for entering elderhood: both are major transitions where the past can’t really guide the future. And in both, some people step into the new stage smoothly, as if born to it, and others struggle. I haven’t found elderhood easy: partly because I was still hooked on being a warrior, a role that suited my readiness for heroic struggle. So you may find that your threshold into elderhood is a loss or a shipwreck. Some women experience menopause as a loss that needs grieving. Or it may be a more general sense that you are losing a level of health and energy as you age. Episodes of loss like this are good to face, and can move you through to gratitude for all the capacities you still have. Recalling Jung’s comments, elderhood is a time to find new aspects of yourself, and new skills which can replace what’s lost. For me, one of the painful changes is having less control in my life, less power to make things happen: but the gift in this is learning to influence situations by the qualities I embody, and the reflections and support I offer others, which I believe is the way of elderhood. The good thing about the lack of role models for elderhood is that you’re free to figure out how you want to do it. Just beware of being limited by the attitudes of society, family or friends. It’s a fair generalisation that most adults in their 20s through 40s narrow their focus: marriage, kids, work, home take most of their attention, although we now see more individuals taking a different path. One of the gifts of the years beyond 50 is the chance to raise your head and look around more widely. This can include deeper links with your local community, new friends, exploring a spiritual path, and finding ways to meet the big issues of our times. One of the vital roles of elders is providing a role model and wake-up call on issues where society is in denial, and this is urgently needed for humanity’s addictive consumption patterns and loss of connection with the earth. Another navigation point which I suggest in mapping your elderhood is how you can serve the tribe. As you look at the troubles and beauty of today’s world, are there issues that arouse you or inspire you? If so, be persistent in finding ways to act on your passion and invite other elders to act with you. Our world may not be calling for the help of the elders, but it certainly needs it. 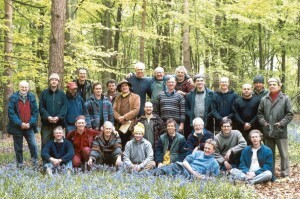 In February 2013, I brought a vision to fruition: co-leading a week-long programme at Findhorn Foundation on elderhood. My co-facilitator Ineke and I, had high hopes for the week, which were more than fulfilled: a tribute to the quality of our participants, to the magic of this spiritual community, and the great support we received from the community there. We used a wide range of approaches, including sharings, meditations, solo time, storytelling, sacred dance, and some inspiring sessions with elders’ organisations around Findhorn. The work of a few Findhorn elders in running the Community Care Circle is especially impressive: includes organising paid and voluntary care for those who need it, building care flats for those whose own home is unsuitable, and providing training and practical advice on many aspects of ageing, including how to receive care. One of the most powerful experiences of the week was when our group joined the weekly Elders Meditation in the main Sanctuary. There was such power and character in the silent presence of nearly thirty elders, with a combined age around 2000 years. For me it highlighted a sense that the beauty of elderhood is about the emergence of full, authentic individuality, and its miraculous interweaving with others. Findhorn is a good role model of a community which already includes and supports its elders pretty well. Our schedule enabled our participants to enjoy this, for example Taize singing every morning, movement classes for oldies, shared meals in the community centre, sacred dance and other shared events in the evenings. Divine unity: open to a sense of divine unity and vitality in all forms of life, including the land, sea and sky. This is what Jesus, in his native Aramaic, calls Alaha. I find this is a good counterbalance to my tendency to focus on my own problems and needs. Creation is now, and we are all part of it: try imagining that our world is being shaped at every moment, and that our job description as humans is to fulfil our part in this process. You can find this idea in the original teachings of Judaism, Islam, and Christianity: see the Genesis Meditations by Neil Douglas Klotz. Gratitude and Celebration: yes, there are plenty of problems, and it’s easy to feel dragged down, but you can feel more resilient, more able to choose, if you focus on what’s positive, and the scope to grow through the problems. Simple presence: you can find this idea in mindfulness, Christian, Buddhist and many other teachings. In essence, the invitation is to be here now, with compassion for yourself and anyone else involved, and to let go of old stories, dramas and projections. Prayer: this idea is often misunderstood. I don’t mean it in a ‘Lord, won’t you buy me a Mercedes Benz’ sense: I mean prayers of conversation and invitation, where you ask to be shown how you can serve the highest good of all, and how you can fill your souls purpose in this human life. Soul’s Journey: I get a new perspective, and a positive approach to upsetting situations, through the belief that my soul has a life and continuity before and after this human time, and that my soul has chosen whatever situations I am facing here and now. Spiritual Community: this is what the Buddhists call Sangha. I find great nourishment and resilience in sharing spiritual practises with a group, and feeling the depth of mutual support which comes from this.